One of the ways we have tried to be more self-sufficient to live a more self-sustainable life. We try to produce our own food, raise chickens, recycle, reuse what we can, and generally live life without being consumer-driven. It is not an easy life to live all the time, but the pay off is great! One of the things I hate is how much trash we throw away. I know we throw away less trash than most households, but all the same we throw away things we shouldn't. Being sustainable is not just about how much trash we throw away, but how much we waste in general. Being sustainable also means making more of where you live and being more self-supporting in terms of the environment. While I support efforts to keep our environment from being wiped out, I know where a large portion of the efforts need to be concentrated. We need to focus on what we use and what we throw away. Being self-sustaining for me also goes hand in hand with being a homesteader and a prepper. Learning to use what I have on hand and being content with what I have will go a long ways towards surviving and thriving. In a natural disaster or SHTF event, being self-sustaining may be what saves you. If you are cut off from other people, but have the means to provide for yourself and to be able to use what you already have to make due, you definitely live longer. 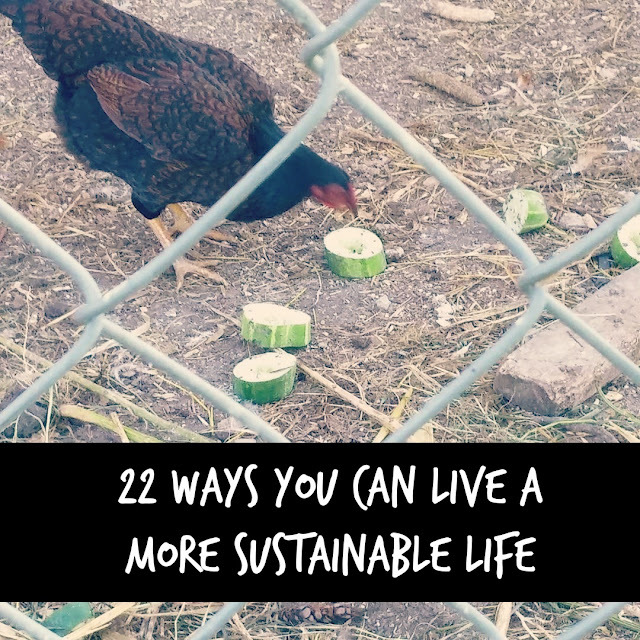 How can you live a more sustainable life? 1. Save water. I have well water and still try to save water. I dump the dehumidifier water in the washer or use it to water plants. I use the water not drank in bottles for my plants inside and outside. 2. Have plants indoors. Grow some herbs. Grow your own loose leaf lettuce in pots. Grow a little bit of food inside. Plants also help clean the air and give a great scent to your home. Plus, you will have some really great tasting food with those herbs. You will also have home remedies on hand with just the plants. 3. Have a garden to feed yourself. You might not be able to grow all the food you need in a year, but you can grow a lot of food to help feed you and your family in the spring, summer, and fall. There are many methods to growing a garden. Find one that suits you. 4. Save paper. I like to have things printed out, but I use a lot of paper for lists and whatnot. I use my phone more for to-do lists. I reuse the backs of paper in the printer. I tear up paper for scratch paper. Read newspapers and magazines online. 5. Use bio-degradable products. Products that break down easily in the environment or landfills is far better to use. Look for products that are packaged in glass or paper and say they are bio-degradable. 6. Reuse everything you can. Many, many things have a second or third use in them. Many things can be reused for other things like glass jars as containers for bulk items. 7. Use rags instead of paper towels. Use cloth napkins or washcloths for napkins. Using these and washing them saves you in the pocketbook and produces less trash. 8. Combine errands and drive less. Have one errand day to run errands. Carpool with others. Walk instead of driving everywhere if possible. 9. Recycle whatever you can. Recycling helps reduce the waste in the world and creates more things which takes less from our natural resources. Everyone should be recycling. No excuses. 10. Compost. Return those materials back the earth in which they came from. We try to compost everything from tea bags, bananas, and cooked vegetable scraps to dead leaves and used bedding. Doing something so simple will yield you much richer soil. 11. Do not waste food. Do not throw it away. Eat leftovers. Freeze scraps and leftovers. Feed it to the chickens, cats, and/or dogs. Compost it. Just don't waste it! 12. Get your food from local sources. Buy from the local farmer. Subscribe to a CSA. Shop your local farmer's market. Buy meat from your local butcher shop. 13. Share your things. If you have something that your friend, family, or neighbor needs to use, share it. Offer to till gardens for others. Share your mower. 14. Stop being a consumer. Break the cycle of buy, buy, buy. We often have so many things and think we need more. We don't need much to live, but we are in a consuming society. We need to stop and use what we have. 15. Stop using disposable goods. Stop with the one-use goods. Use cloth diapers if feasible. Use rags instead of paper goods. Stop using Styrofoam. 16. Use a bicycle or walk to get where you need to go. I realize living in a rural area that this might not work. A lot of times I will park the car when I get to a town and walk to where I need to go. We all need the exercise. 17. Buy used. If possible, buy used before buying new. Buy clothes from the thrift shop. Used goods stores have so many things that are in such good condition. I always look there first. Buy used vehicles that are reliable and can be driven for years. 18. Use the library. Great selection of books. You can often inter-library loan books from other libraries if your library doesn't have it. You can use computers there if you need to. You can check out movies for little to nothing for cost. 19. Preserve your own food. Can, freeze, ferment, and dehydrate your own food. There are so many recipes out there to preserve your food and rely on the grocery store less. 20. Become a zero waste household. Commit to reusing and recycling anything and everything. Bring your own containers for bulk goods. Recycle as much as possible. 21. Be frugal. Pay cash. Don't spend money unless you have to. Stay home and have fun there instead of going out all the time. Buy used. Borrow what you need from your neighbors or family. Make your own food instead of getting carry out. 22. Fix your things. If something breaks, try to fix it. With so many online tutorials, YouTube videos, and great reference books, you can fix almost everything yourself. Invest in a good tool kit and you will be set! What would you add to this list to be more self-sustaining?